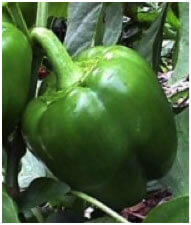 Pepper, Sweet – Bell Boy F1 is a prolific thick walled pepper with a sweet flesh and good disease resistance. Best used when green. Only grow with protection. Sow 5 seeds into a small pot (7cm) and keep in a warm place. Pot on into individual 7cm pots when ready. Plant into greenhouse or polytunnel. Peppers are a useful crop for the polytunnel or greenhouse. But don’t necessarily expect to grow the large yellow or red supermarket ones. All peppers start off green and eventually turn yellow, orange, red or even purple or black as they mature. In our climate you will get a much higher yield if you harvest the peppers when they are still green. Peppers require the same growing conditions as tomatoes but the yield is much lower. One advantage, however, is that the plants won’t grow more than 1m in height so they can grow at the south facing edge bed. 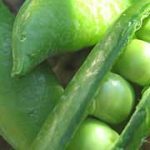 Peppers require a very fertile and free-draining soil with a reasonable amount of well-rotted manure added to it prior to planting. The pH should be between 6 and 7. They should be grown in full sun. Peppers are very slow starters so I usually sow the seeds as early as February and place the trays on a warm heating bench (20˚C). The seeds are sown in a small pot or standard seed tray about 2cm apart from each other and covered with 1cm of sieved seed compost. The seedlings will appear about 2 weeks after sowing. 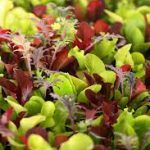 When the first true leaf appears the seedlings should be pricked out individually into small pots using a richer potting compost (7cm). And when they are well rooted they can be potted on into 10cm pots. They should remain on the heating bench until they are planted out into the greenhouse soil in May. Peppers should be spaced 45cm apart each way. Support each plant with a bamboo cane. Water regularly and feed with comfrey liquid when fruits begin to form. Harvest peppers as soon as they are a reasonable size. The fruits should be cut using sharp secateurs. You may get between 5 to 15 fruits per plant, depending on the season, soil fertility and especially on the choice of variety. Peppers are susceptible to greenfly, whitefly and red spider mite. 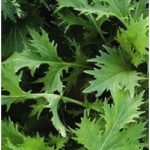 As a prevention you can spray with a garlic and nettle spray once a week.